Inspiration, guidance and tools for launching and sustaining a congregation-based program to identify and support individual members affected by drug and alcohol addiction. Incorporates up-to-date information from addiction science and pastoral care. One Sunday, a minister stood in front of the congregation and invited anyone whose life had been seriously affected by addiction to come to the front of the sanctuary and light a candle of hope. As he stood there, knowing the statistics on addiction and understanding the damage that it can inflict on a user’s friends and family, the minister wasn’t sure how many people in the congregation would be willing to acknowledge their experience so publicly. But so many people came forward that at one point, the line moving toward the candles reached to the rear of the room. After the service, the minister counted the candles: Well over two-thirds of those attending the service had come forward. Since that day, he has used this ritual element in Sunday worship services many times and with similar results. On several occasions, virtually everyone in the pews has acknowledged a personal experience with addiction. That minister was me, and I belong in that line of people coming forward to light a candle. After a downward spiral of around-the-clock drinking that lasted for years and finally left me incapable of going on with life without help, I ended up in a detoxification/rehabilitation hospital. The day I hit bottom marked the beginning of an odyssey of recovery, discovery, and new life. In the early stages of my treatment, I learned what I needed to do to stay sober and reclaim my life. I also learned that addiction is the great equalizer. My eight companions in treatment ranged in age from nineteen to seventy-two, in education from high school dropout to M.B.A., and in social standing from street person to high-ranking administrator in a city police department. They were male and female; gay and straight; white, Hispanic, and Asian. After only a few days in rehab, this disparate group bonded and showed a level of mutual care and respect that would have surprised many of us, had we encountered it outside the hospital. We came to understand the essential vulnerability of being human, and we learned that by pooling our strength, we might have enough to help all of us heal. Two simple notions have formed the foundation of my recovery and my work. First, while addiction has physical, psychological, and social consequences, recovery is essentially a spiritual undertaking—a journey of reconnection to one’s true self and deepest values as well as to others and to the life force, the source of good in the universe. In a religious sense, addiction can be understood as idolatry, and casting out the false idol is only the first step in recovering one’s spiritual footing. The second foundation is that recovery takes place in community—a caring, supportive community of fellow substance abusers and committed, nonjudgmental caregivers who respect the worth and dignity of every individual. Faith communities can and do make a difference in the lives of families struggling with addiction problems! 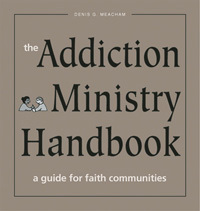 Meacham's The Addiction Ministry Handbook is an excellent resource for Unitarian Universalist congregations and their lay leaders? for the knowledge found on every page, the inclusive attention to our broad spiritual foundations and for the practical tools it provides for caregivers and addiction ministry committees. The author pays close attention to the pervasive complexity of addiction and calls our faith communities to a ministry of healing and wholeness. I highly recommend this handbook for the knowledge, spirituality and skills it offers to people of all ages and families of all kinds. I encourage every congregation to take up this important ministry.